He has captured the hearts of Blades fans since arriving on loan – and Dean Henderson further ingratiated himself with the Sheffield United faithful this weekend with a cheeky Instagram post poking fun at one of the club’s rivals. Henderson, away on international duty with England U21s, played 90 minutes on Thursday as Aidy Boothroyd’s men drew 0-0 with the Netherlands. The song – which signs off ‘playing football, the Norwich way’ – was coined during victory at Carrow Road last season, with United fans infuriated by the Canaries’ time-wasting antics at Bramall Lane earlier in the campaign. 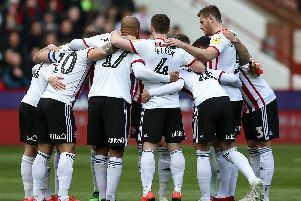 It was sung again this season when Daniel Farke’s side came to Bramall Lane, and Billy Sharp scored a late winner to seal a 2-1 victory for his side. In an interview with The Star earlier this season, Henderson admitted he relishes his close bond with United’s fans and added: “I’m a passionate boy, and I really want to do well anywhere I go. I also become a fan of wherever I go, too. It was the same at Shrewsbury last season, and now the same at United.